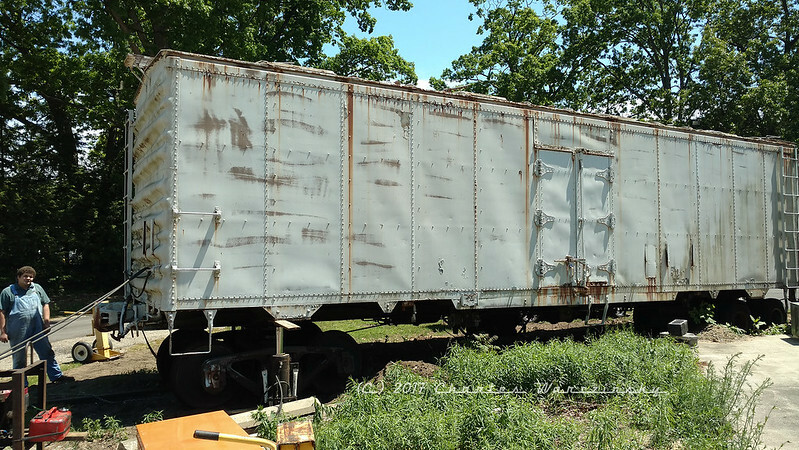 The Port Huron & Detroit Railroad Historical Society recently acquired a refrigerated boxcar (or reefer) once owned by the Grand Trunk Western Railroad, identified as GTW 206447. The car spent the past several decades on a disconnected industrial spur on the north side of Holland, Michigan. 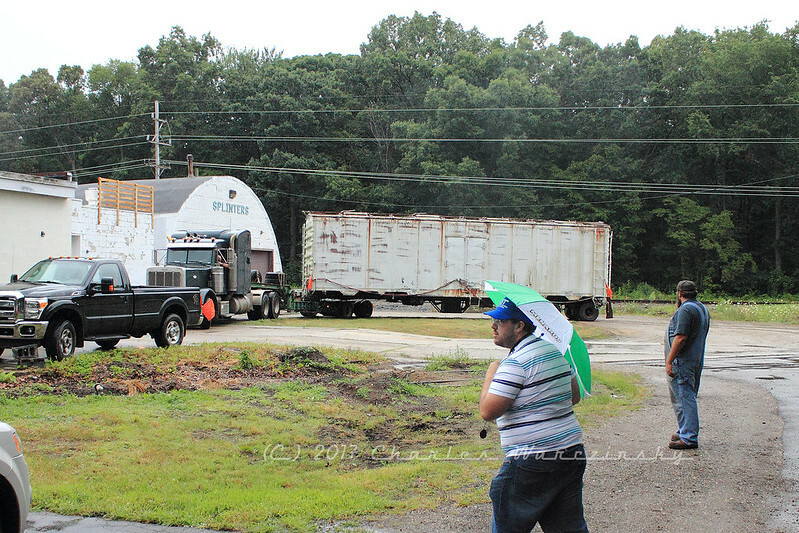 The move to the cars’ new home near Port Huron, Michigan, took several months to accomplish. The car was offered to the Society free of charge, as is, where is. The Society’s Reefer Project Manager (and chief T-Shirt designer), Chad T., raised the money to move the car, secured a reputable company to complete the move, and generally made sure the project stayed on course. The reefer did not make the trip in one piece- I missed the first trip to Holland, where one wheelset was removed, replaced by highway axles and transported to Port Huron, but I was able to watch the subsequent trips to relocate the second wheelset, move the body off the spur, and eventually move the body out of Holland. The following video and photos are from my observations of this move. The first time I saw the reefer was May 29. 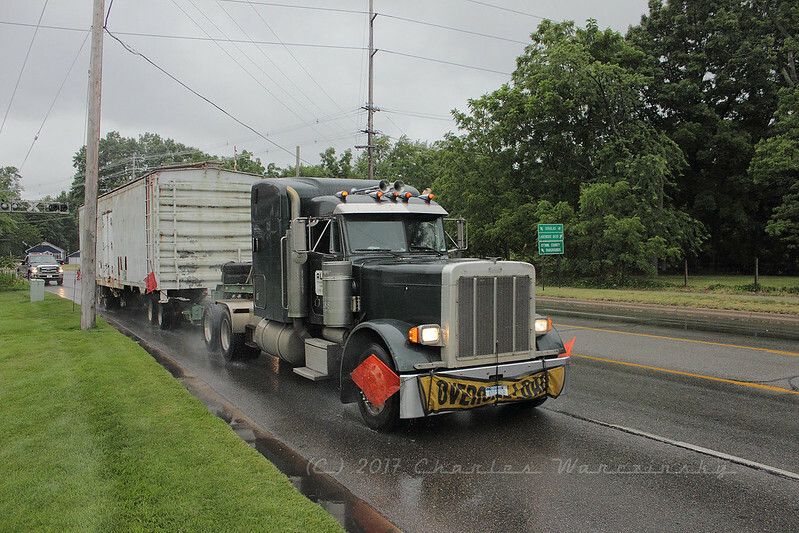 By the time I was able to make the trip to Holland, one wheelset had already been relocated back to Port Huron and had been cleaned and painted in preparation for the reefer body’s arrival. One thing that seemed to resonate throughout the course of the each of the trips I made to observe the move was that each trip that was made was THE TRIP when the entire car would be relocated. Of course, when it either came time for the actual trip to be made, or sometime after arrival in Holland, word came that for one reason or another, the actual move of the body of the reefer wouldn’t be taking place that weekend. So…what was supposed to be one or two trips turned into three trips for me, and well beyond three for Chad and a couple others. My intent in this post is to share the process of the move as I observed it, mostly through photos taken along the way, with some captions and other descriptive stuff thrown in. Even though I didn’t get involved until the middle of the project, I found the parts I got to see and participate in were very interesting and very educational. My story starts on May 29, 2017 (coincidentally, Labor Day 2017). I don’t have much information about what happened prior to that day, but after having planned to go Saturday and/or Sunday, only to have something come up and the trip(s) be cancelled, word came sometime Sunday that the trip would be taking place that weekend, and that it would be Monday. It took me a while to catch on that nothing about this move was punctual. Instead of productively using the trip that Monday to relax and enjoy the scenery on my way west, I wound up sitting in a parking lot, staring at the reefer for at least an hour before the reefer project manager (who was already familiar with how the moving company operates) arrived. While waiting for the moving crew to arrive, we tackled the mess underneath the reefer. Apparently the area underneath the car became a great place to stash stuff nobody wanted to deal with over the years, specifically leaves in the fall, so the area under the car was packed with garbage and decaying leaves. 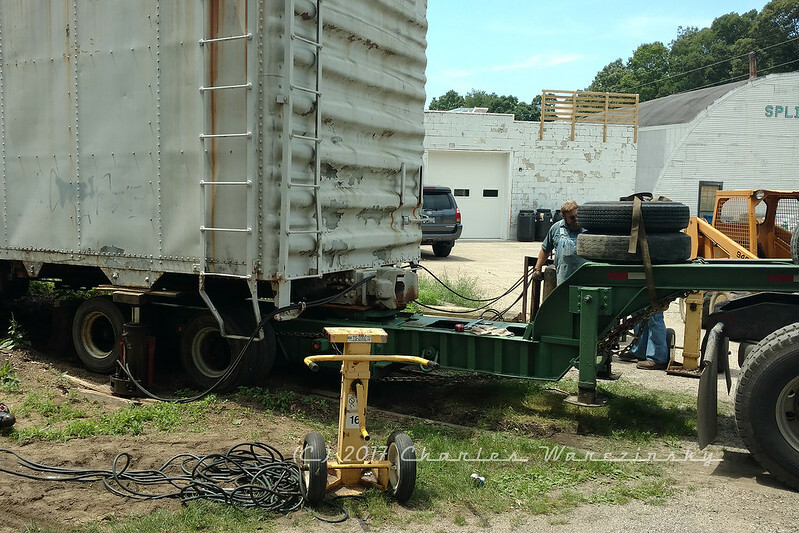 To show our appreciation for the owner’s willingness to donate the reefer and underlying track materials, Chad felt we should leave the site where the reefer had been in better condition than it was in when we arrived. So…we broke out rakes and garbage bags and went to work digging out the leaves and other crap from underneath the car. It took a while, and getting under the car to remove some of the stuff wasn’t easy, but in the end we wound up with a couple garbage bags packed almost to the bursting point full of leaves and other debris. Once the moving crew showed up, things got a little more interesting. Basically, in order to move the car, the idea was to jack up the car, remove one wheelset at a time, and replace them with axles. By the time the car actually left Holland, it had 3 axles at the rear of the car, and two axles under the front of the car. After the first wheelset was removed, two axles were initially placed under the car. 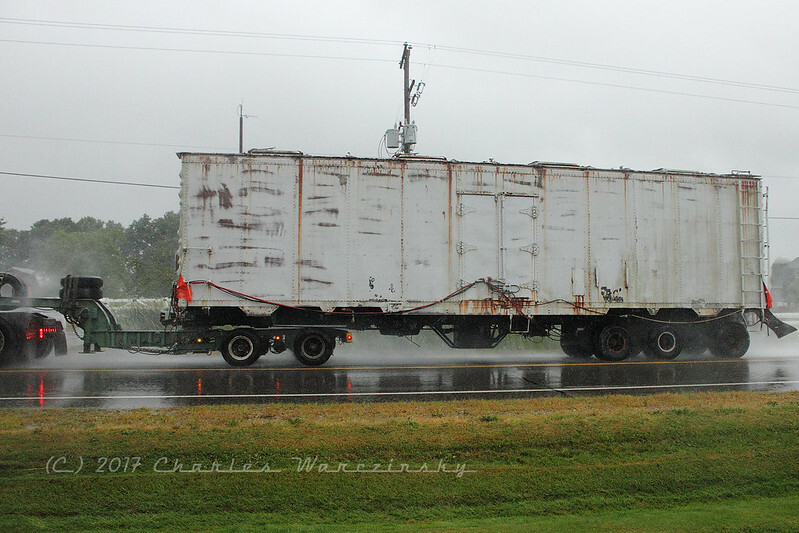 It wasn’t until the car was removed in July that the third axle was added to the pair. 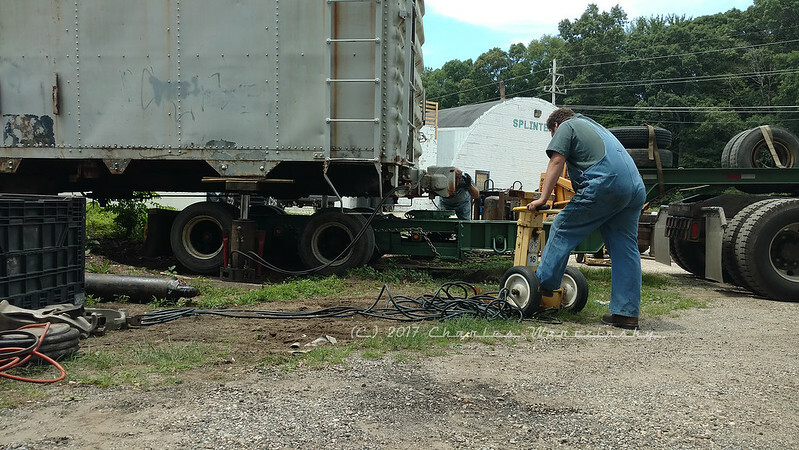 After the 2nd wheelset was removed, jacks and jacking stands were used to support it until the trailer could be attached several weeks later. The 2nd wheelset was removed on Labor Day. 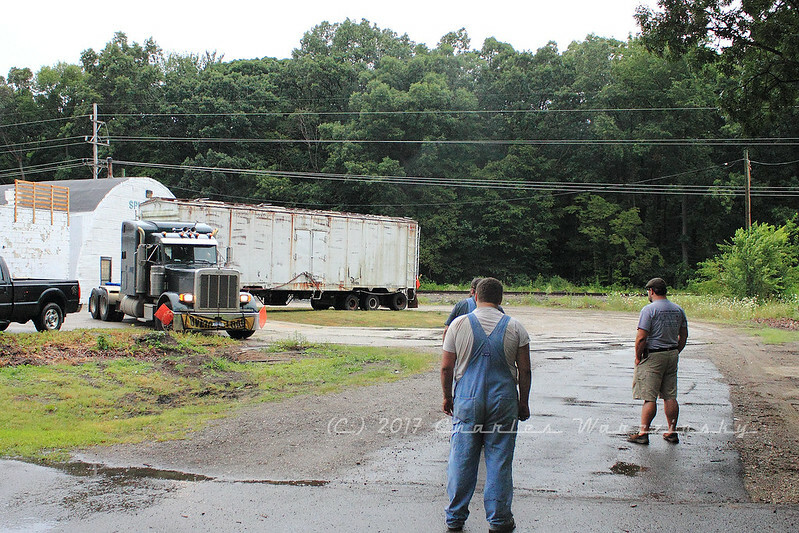 The first series of photos below show the truck removal process (Labor Day) and the trailer addition process (July 9, 2017). 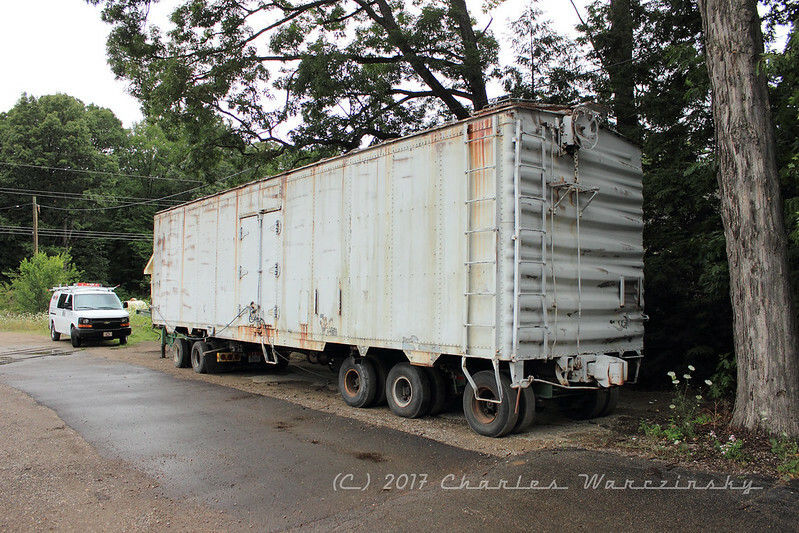 After the wheelset was removed, before the jacks and stands were fully in place, a plate with a kingpin welded to it was bolted to the bottom of the coupler pocket on the end of the reefer closest to where the truck would eventually be positioned. 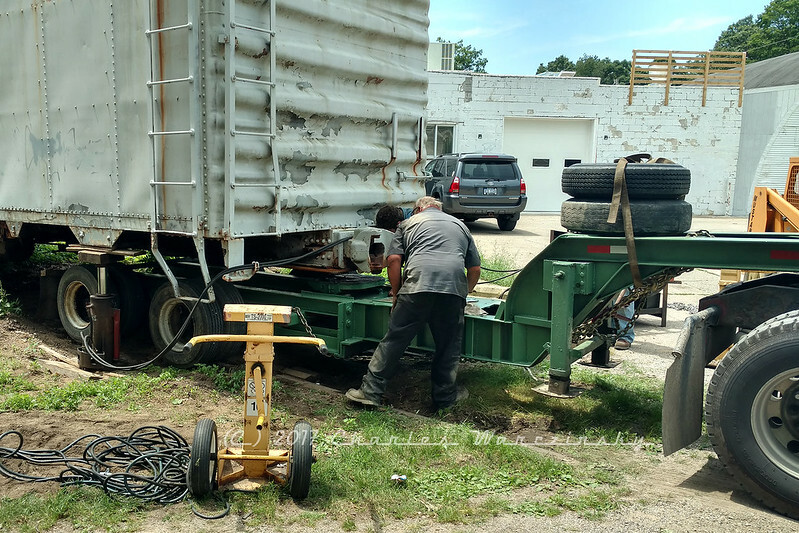 The process of fitting and attaching the kingpin plate, and loading the removed wheelset and attaching it to the trailer for transport to Port Huron took most of the afternoon. The reefer body is jacked up so that the second wheelset can be pulled out from underneath. 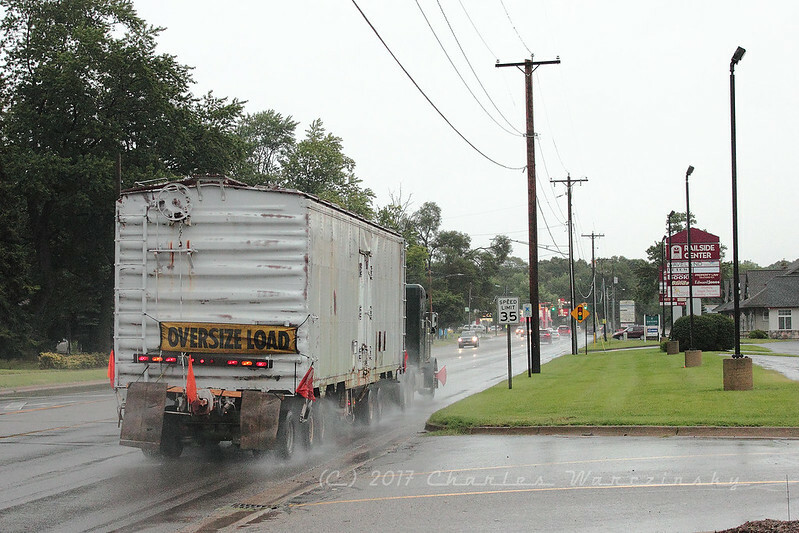 The reefer will remain jacked up for several weeks following this removal. The second wheelset was delivered to the PH&D property near Port Huron a couple days later, where it was cleaned and painted in preparation for the arrival of the reefer body. 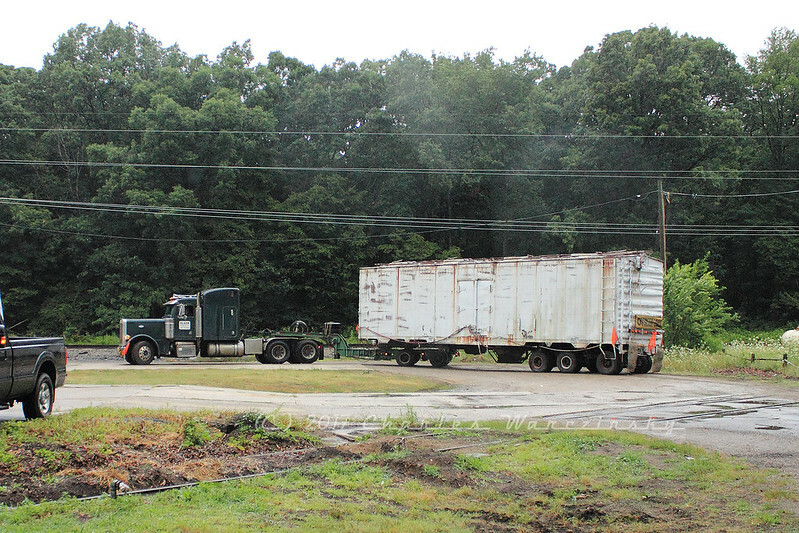 Several weeks later, word came that the reefer might be moved on July 9. Unfortunately, due to a construction detour issue, the proper permits were not pulled and the reefer could not leave the shopping center property. However, it was removed from the siding it had spent the past several decades sitting on/above. First a shot of the trailer that would be used to pull the reefer east being guided toward the king pin installed on the reefer back in May when the second truck was removed. 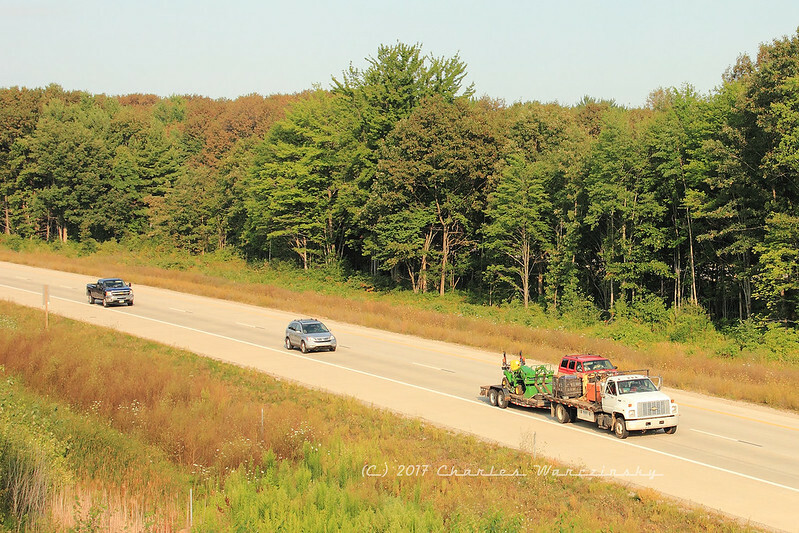 It took a couple attempts to get the trailer lined up correctly as the kingpin attached to the reefer body was still high above the fifth wheel mounted on the trailer. 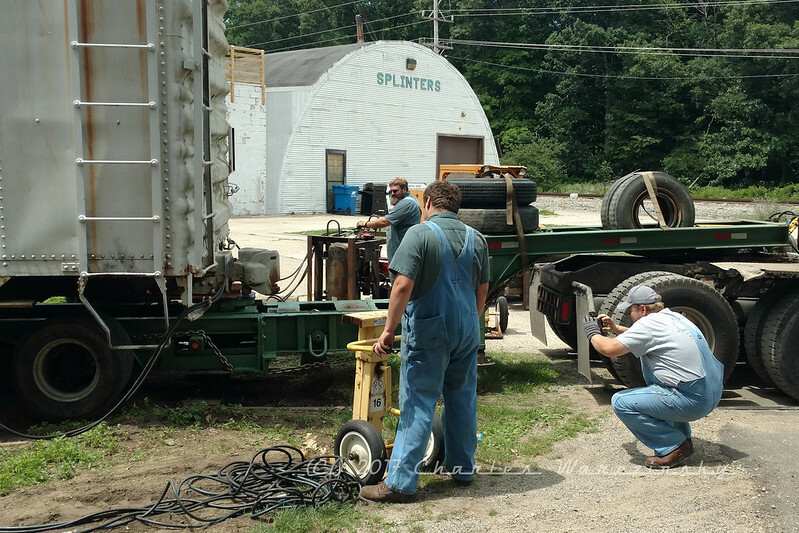 The reefer body is lowered toward the trailer, as the reefer project manager records the moment on his mobile device. The driver, and moving crew chief, makes final checks before pushing the trailer back to engage the kingpin. The trailer engages the kingpin. 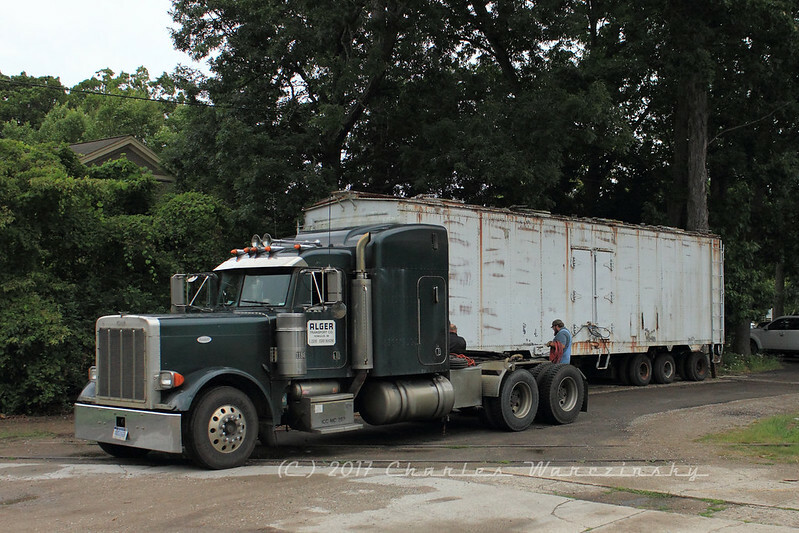 The movement was followed by the reefer and trailer being parked in just about the same place it ended up at the end of the video for several weeks. 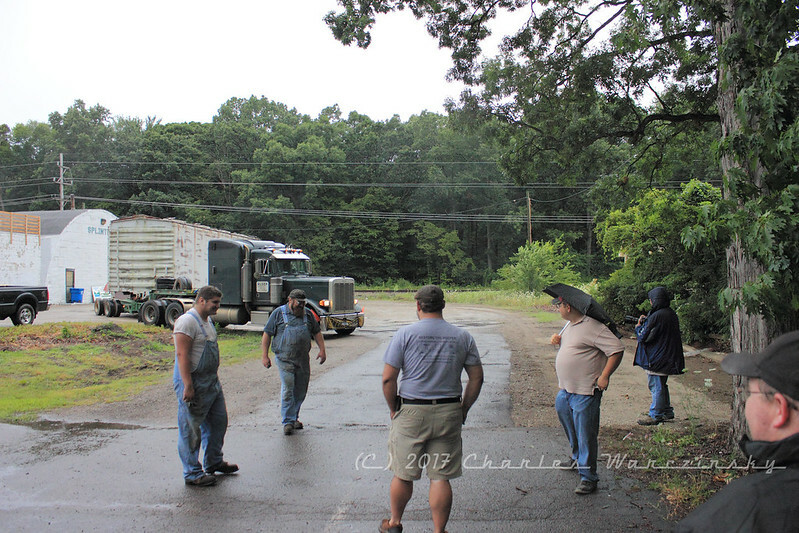 The next movement of the reefer didn’t take place until the weather took a rather wet turn, coincidentally on the first weekend of August, 2017. My planning for the eventual move could have been a lot better. I had one weekend all summer with a unbreakable commitment, but my employer surprised me by giving me the Friday before the weekend off, despite a very last minute request. With setup for the weekend taking place on Friday morning, about 25% of the distance to the reefer’s site in Holland, and the reefer movement not scheduled until mid-afternoon or early evening, it became clear that the opportunity to chase the reefer’s trip east was pretty much being handed to me on a big platter. Unfortunately for the guy who was supposed to ride over with me to document the move, I didn’t realize this until about 5:30 Friday morning. But…it was apparently meant to be as Sam got my message about chasing the move shortly after waking up and was able to find a ride to meet me where we were setting up for a weekend of N scale trains near Flint with plenty of time before we had to head west. As it turned out, even though the weather on our side of the state was warm and sunny, it was raining on the west side of the state. This would be the first trip during the project with anything other than sun in the sky, which I decided to take as a good omen (as opposed to complaining about the rain). Somehow, the lesson that punctuality isn’t in the moving group’s vocabulary still hadn’t sunk in, and instead of planning spots to shoot the movement from that would be historically significant, I just drove straight to Holland. So…we missed a couple spots that we probably should have shot from, including one less than 2 miles from the overpass we shot off of instead. BUT the shots we did get are probably better than no shots at all would have been. Here’s where the reefer spent the intervening month or so, waiting to leave Holland. Upon arrival in Holland, the moving crew wasted no time getting to work. Leaving the shopping center necessitated a rather wide U-turn through the grounds on the east side of the property. The following is a short documentation of that turn, and the amazement felt by many (and expressed by one) in attendance. 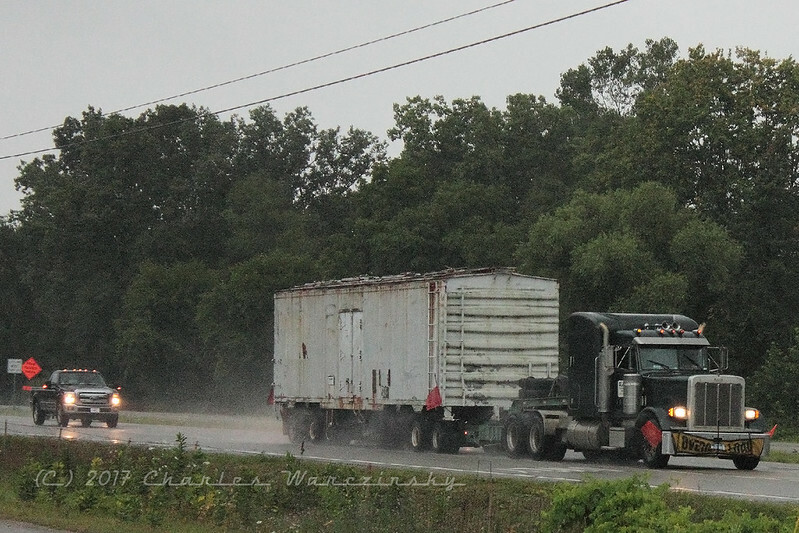 Others have photos and videos of the truck’s actual departure, but in the time it took them to leave the property, Sam (videographer who was bumming rides from me for the move) and I had enough time to set up to catch the reefer crossing CSX’s Ottawa Beach branch, on which the reefer would have had to have made its’ final trip by rail (to the spur from which the truck had oh-so-recently retrieved it). We also watched it go through Zeeland. 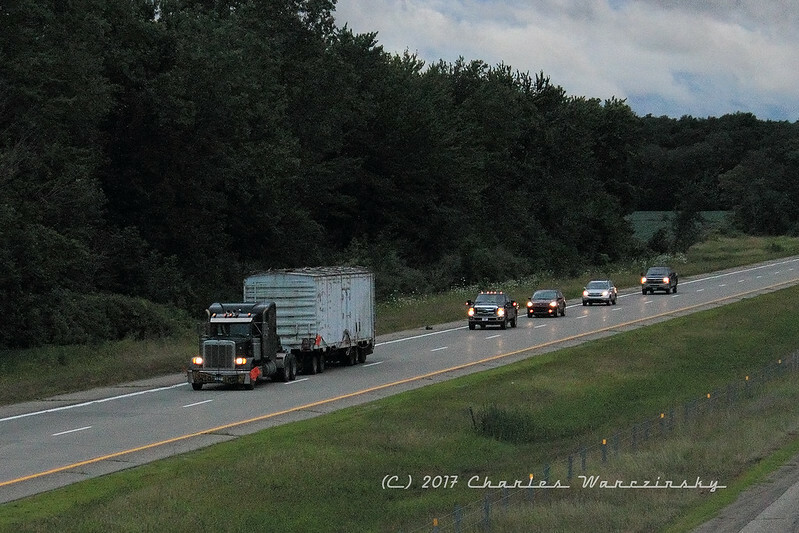 I used some of my experiences chasing steam locomotives over the past couple years to try to stay ahead of the movement, but…most of the steam chases took place on roads I was already familiar with. I’d never seen most of the two lane roads utilized by this movement before, and combined with a general unfamiliarity of the area and a navigator who’s never really had to navigate with me before, and we eventually wound up about 10 cars behind the truck. We weren’t able to get in front of the truck until it neared the ramp onto I-196, but we were eventually able to get far enough ahead to set up on a desolate overpass to get the following shots. 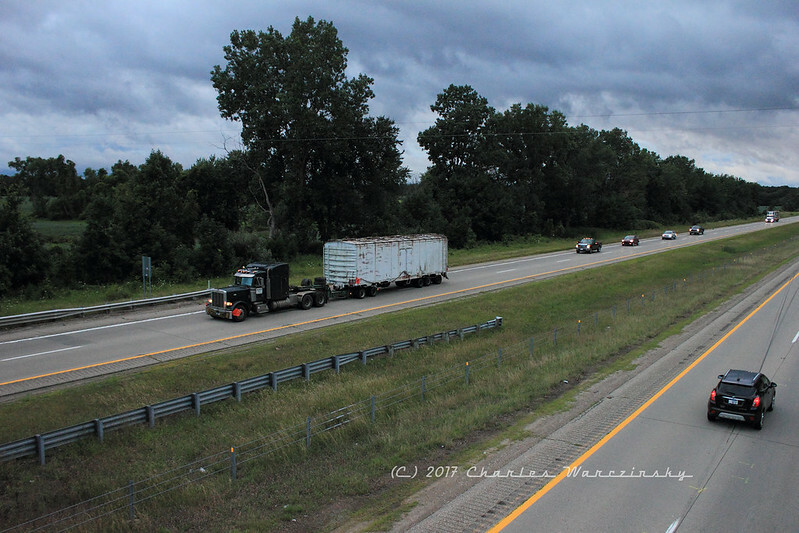 The height of the reefer body above the road required the truck to move to the middle of the highway to clear the arched overpasses found along I-96 west of Lansing. After going back through the shots above, I see I have yet to process some of my documentation of the move. As I work to correct the missing documentation, I will add it to this post. Great video and photo story-telling, CW. I admire all the effort and am so happy it is being preserved. Thank you for creating and sharing these.